Now, isn't this looking summery and lovely here? Don't you want to have ONE for yourself? If yes, then you may continue read on HOW TO win one for yourself! As mentioned in my previous post, we were brought to another space for another session of Chandon Cocktail Masterclass at Eight Gourmets Gala (EGG) at Sunway! Dan Buckle introduced us the new Chandon Summer 2015 Limited Edition featuring nautical stripes that perfectly resembles summer season and, of course, a one or two tricks for the perfect cocktails making! This special cocktail masterclass was guided by EGG's skillful bar manager to learn the fundamental steps of crafting creative bubbly flavors with the Chandon Brut. The educational and engaging masterclass featured two easy-to-make Chandon sparkling cocktails that perfect for any gathering or celebratory occasion. Key ingredients were well prepared! LOOK! We made it ourselves! I think my favorite would be the Green Demon! It tastes so refreshing and pretty addictive! Chandon Brut is the perfect drink for the summer. When chilled, with its refreshing bubbles, it celebrates the summer like no other. Chandon in collaboration with EGG will feature two tantalizing cocktail promotions from 15th May till 31st July 2015 at RM 28+ for each serving. Crafted using Chandon Brut as the main ingredient to highlight the complexity and vibrancy of these cocktails, sparkling wine lovers can choose between Green Demon - made of Gin, Mint, Monin Lemon Grass, Cucumber and Chandon Brut; or Lola -made of Belvedere Vodka, Fresh Apple Juice, Watermelon Syrup, and Chandon Brut. The summer bottle was added in Chandon’s repertoire in 2012 when the US created the first one then Brazil and Australia joined the celebration of summer soon after. Now Chandon’s limited edition is developed in all its markets where sparkling wine will make summer truly cool. Summer puts you in the mood for poolside glamour, sandy beaches, and nautical adventures or to simply just remain indoors and stay cool. 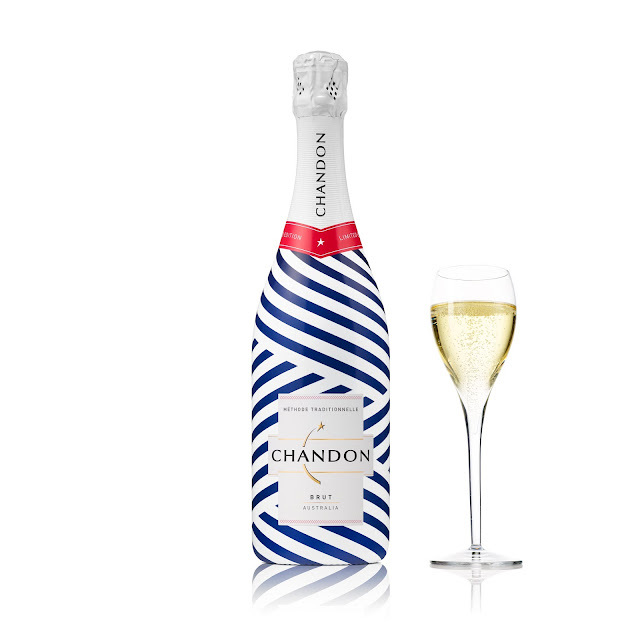 The Chandon summer bottle’s modern take on stripes immediately invokes a vivacious mood. The foil’s silver tone serves as a gleaming beacon, signaling that the only requirements for a glorious summer are your favorite friends and chilled Chandon bubbles! Stand a chance to win a Chandon Summer Limited Edition bottle every month in June and July 2015. Step 2: Post it on Instagram, insert #chandonsummermy and tag the outlet (where the picture was taken). - Winners will be contacted through Instagram. by public for tracking purposes. Enjoy Chandon Summer responsibly. The Chandon Summer 2015 bottle is available in 75cl from June 2015 onwards at selected retail outlets, bars and restaurants.